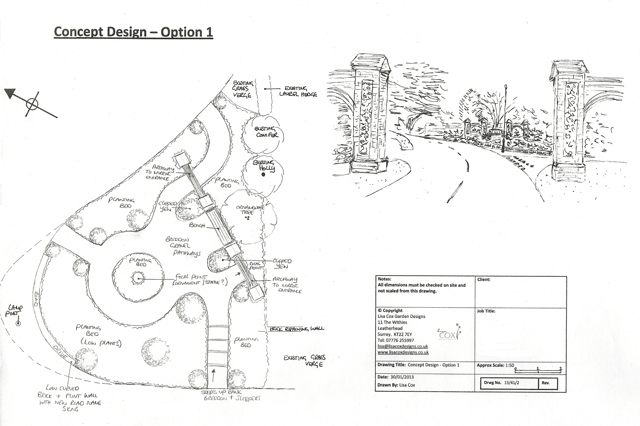 Last week I presented three different concept designs to a residents association in Leatherhead who are looking to improve the entrance to their estate. The area in question is a large grass verge area which is currently quite overgrown. 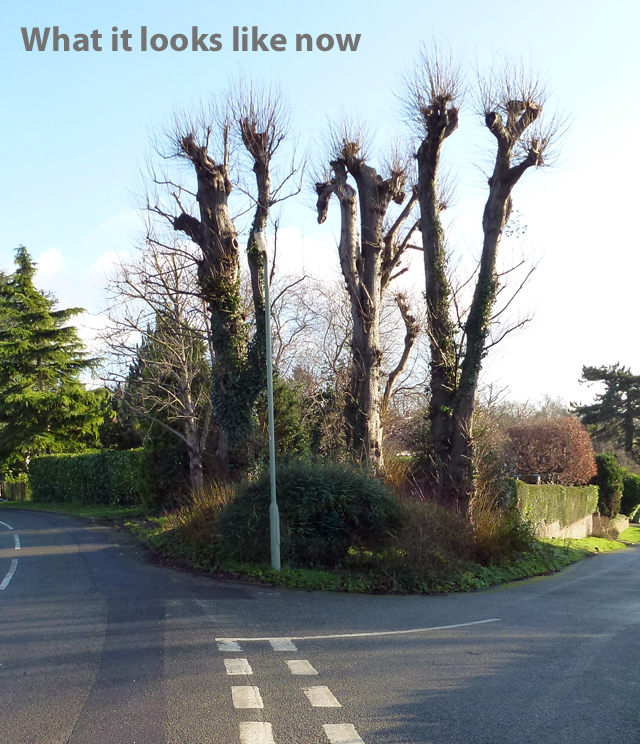 The area is also home to three large and unattractive Lime Trees which have been pruned really badly over the years. The decision has already been made to remove the trees, but they now want some help to replace them with something more appropriate. We agreed that I would offer them three different concept design ideas to consider. It wasn’t until I surveyed the plot that I realised just how big it is, almost as big as my garden in fact, so I felt that each design should allow movement through the space as well as provide a welcoming entrance to the estate. Concept one is the most formal. This scheme links back to the brick and flint arches that are positioned either side of the road as you enter the estate. The archways at the back of the area mirror the entrance but also provide a frame for a bench seat. The pathways are informal but allow movement around the space and will make maintenance easier. The planting would be low and structural, with some topiary to mirror a large clipped Yew in the garden of a neighbouring house. 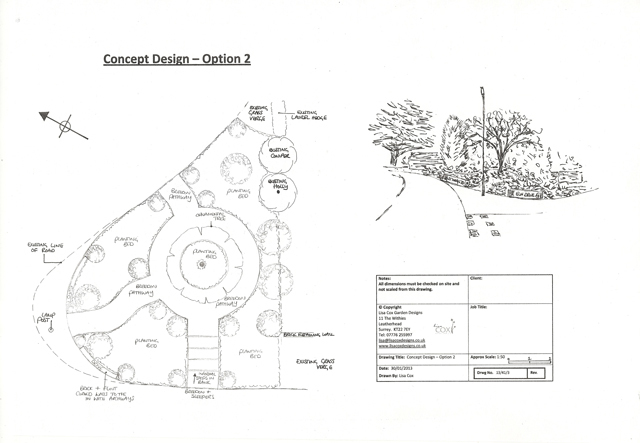 Concept two is simpler in design, with the main feature being an ornamental tree in the middle of the plot. This would be something that offers interest all year round, blossom in the spring, good autumn colour and nice bark for winter interest. Again, the pathways allow residents to walk through the space. The planting would be low maintenance, but interesting and predominantly evergreen for year round interest. Concept three is the least formal. 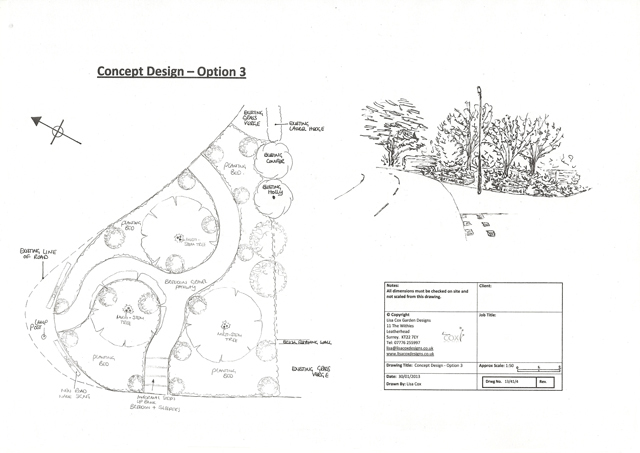 Three ornamental trees would be planted with woodland style informal planting. The trees would be more appropriate for the space, something like Betula utilis var. jacquemontii which has amazing white bark, or Prunus serrula which has gorgeous mahogany bark. All three designs were presented at a recent meeting and the decision has been made at this stage to take out the Lime trees initially and then clear the site. This will allow them time to consider all three options and establish which scheme best fits in with all the residents. So, I have been “stood down” for now but will look forward to hearing from them when they’re ready to move on to the next stage.